The convenience of cars for personal transport, coupled with the unique place they occupy in the national psyche makes the likelihood of us all turning our collective backs on them seem pretty remote. While we may not be willing – or able – to abandon them entirely, liking driving does not mean you have no green conscience and a range of eco-friendly cars driven by various forms of energy have been developed to help ecologically aware motorists do their bit. Even so, making a clean break from petrol remains difficult. Hydrogen fuel cell technology is widely tipped to be the future of personal road transport, but it is still some years away from entering the mass market; electric cars are with us already, but their range is limited and solar cars are not exactly designed for the UK! However, it is not all bad news – hybrid cars, which rely on a small petrol or diesel engine to make electricity to drive an on-board electric motor – offer what is probably the most practical option of all of the currently available “green” solutions being promoted. There are several basic designs of hybrid cars on the road, differing in how the two systems connect, when each runs and their relative contribution to the vehicle’s overall performance. 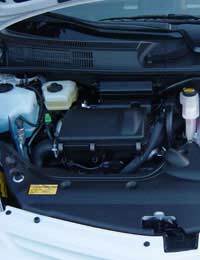 The basic principle involves the clever combination of a traditional internal combustion engine with an electric motor, the engine feeding power directly to the motor when it is running and topping up the batteries if it is not needed – going down hill or during heavy braking, for example. Most designs use “regenerative breaking” to recover the energy otherwise lost when the car slows down – simply running the motor backwards, making it act as a generator to recharges the on-board batteries. Many types also automatically shut off the petrol engine when it is not needed – while waiting in traffic, for instance – to save energy. This is not a unique idea, however. It was first pioneered by Subaru in a conventional design of the early 80s, the concept being later used by Volkswagen in some models. The most commonly produced hybrid cars at present – technically known as “parallel” designs – connect both the electric motor and the internal combustion engine to the mechanical transmission system. Typically, a large electrical generator/motor unit is used, which replaces both the traditional starter motor and the alternator together with a large battery pack. The Toyota Prius, for example, uses an on-board computer to optimise the whole operation, running on electric-only whenever possible, the petrol engine only being used when extra power is needed. The Toyota “Hybrid Synergy Drive” system, coupled with improved aerodynamics and increased engine efficiency, is claimed to give the Prius more than 80 per cent better fuel economy than conventional vehicles of similar size and weight. Series designs – in which the engine is not directly connected to the transmission, only being used to power the electric motor – are in effect self-charging electric cars. Though there are some advantages to this approach, for a variety of technical reasons, the design is little used in mainstream production models. There are not many types of these cars available in the UK sale rooms and they do tend to be 10 – 20 per cent more expensive than comparable conventional vehicles, but they do benefit from low road tax. Although a recent “Which?” test suggested that hybrid cars may not routinely achieve the declared fuel economy figures, it did support their claim to significantly lower CO2 level emissions. Even if they are not perfect, hybrid cars are probably the best option currently available and though the choice may be distinctly limited, the likes of the Honda Civic IMA, the Toyota Prius and the Lexus 400h SUV are certainly worth a good look.